It’s a deck of cards, for you to use on your own, with a group, a team, a partner, or even a coach. The cards are designed to help you out with situations, projects and questions at home or in your work life, or in a coaching environment. 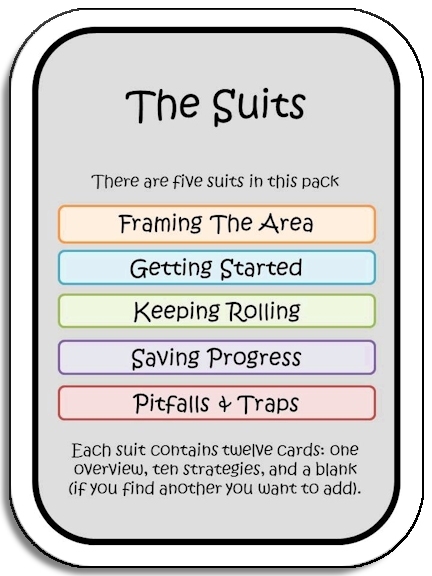 In fact, you could carry the cards around with you as a handy tool and use them anywhere! Each card gives you a whole new perspective on your situation by asking you to consider your rock in a new way. We’ve created 5 suits of cards, each with a different theme or approach – because rocks can sometimes be more easily cracked from different angles. We’d recommend you read all of the cards to get started. That way, you get a flavour for what’s to come. We want to encourage the inventor in you to discover the way the cards work best for you. If you’re not feeling all that adventurous, you can get stuck in by drawing a single card at random, or by deliberately selecting one or more cards that suit you best.